Scheme extended to include Mayo, in addition to Sligo and Leitrim. IT Sligo students are providing football coaching to boys and girls throughout counties Sligo, Leitrim and Mayo – and to underage players in New York. As the unique IT Sligo/Cumann na mBunscol partnership celebrates its 10th anniversary, the coaching programme has been extended this year to include schools in Mayo, as well as Sligo and Leitrim. In addition, on the 10th year of this scheme the Ladies Gaelic Football Association has come on board so now students are going out with coaching awards for both the LGFA and GAA and are more equipped when going from school to school on a daily basis. Liam Og Gormley, the GAA’s games promotion officer in Sligo and co-ordinator of the programme was delighted to have the LGFA on board. “We are delighted to have the LGFA on board as it strengthens the programme and coaches are provided with more knowledge when coaching. It is great for the LGFA to be involved with this initiative”. There is a certain number of ladies players involved in our coaching scheme such as Amy Crosbie and Ann-Marie Carragher Meath, Emma Dardis Longford, Aisling Griffin and former Minor Connacht Championship winner Cliodhna Moloney from Galway, Dublin Ladies player Kim Flood, Yvonne Davitt and Colleen McHugh Mayo and Joanne McDonnell Sligo. Also, Ruth Cox from Roscommon is coaching on a weekly basis while on work placement for the Connacht Ladies Association, Sligo Ladies and the Sligo GAA. Under the scheme, which is a highlight of the school calendar for school children in the region, 21 students from the Bachelor of Business (Recreation and Leisure) degree programme are spending 13 weeks coaching over 5,000 young players. The programme, which is currently underway, continues weekly until May 25th. “As usual every single primary school in Sligo is benefiting. Last year Leitrim got involved and this year we have expanded the scheme to some schools in Mayo,” explained Roddy Gaynor, programme coordinator and lecturer on the three year degree course. He revealed that another of this year’s batch of students is currently doing a work placement with the New York Celtic GAA club, coaching under age players there. One of these coaches includes Mayo Ladies Football player Kathryn Sullivan. While the Cumann na mBunscol programme, the only one of its kind in the country, gives students invaluable experience in the workplace, it is also warmly welcomed by teachers and pupils in the participating schools. Thomas Keenan, the GAA’s games promotion officer in Leitrim said 12 schools in north Leitrim were participating and all were full of praise for the “IT coaches”. “I have been out and about visiting the schools and the teachers were delighted with how it was going,” said Mr Keenan. “The scheme can only be as good as the coaches and all the teachers were delighted with them”. Mr Gormley pointed out that it isn’t just the teachers who are thrilled with the coaching. “The kids absolutely love it,” he said. “Parents tell me that even if they are genuinely sick, it is the one day of the week when they want to go in”. Mr Gormley said that the IT students were highly trained before they go out to the primary schools and were providing coaching which was tailored to the different age groups. Mr Gaynor explained that the students are multi-skilled and during the business degree course, attain 10 national and international qualifications including European gym instruction, personal training qualifications, national swim instruction and lifeguarding awards as well as GAA, LGFA and soccer coaching. 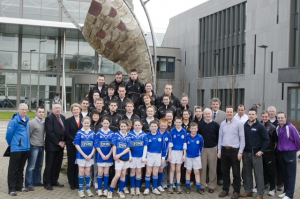 Cumann na mBunscol have for a decade been enthusiastic participants in the work placement scheme which enriches the experience of primary school students in counties with a strong GAA tradition, while encouraging a new generation of potential county players. Students from the Bachelor Business (Recreation & Leisure) programme with children from Geevagh national school at the launch of the Cumman na mBunscol primary schools GAA coaching programme. Also included is IT Sligo President, Professor Terri Scott, Roddy Gaynor, Lecturer IT Sligo, Nicky Bruges of JAKO (Sponsor), representative from County Sligo and County Leitrim GAA, Connacht Coaching Director John Tobin, Ladies Gaelic Football National Development Officer Will Harmon and Cumman na mBunscol Chairman, John Hughes.